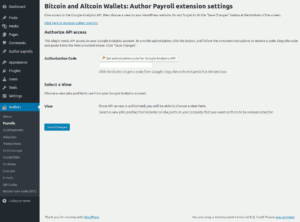 Pay your article authors with cryptocurrencies based on Google Analytics metrics. 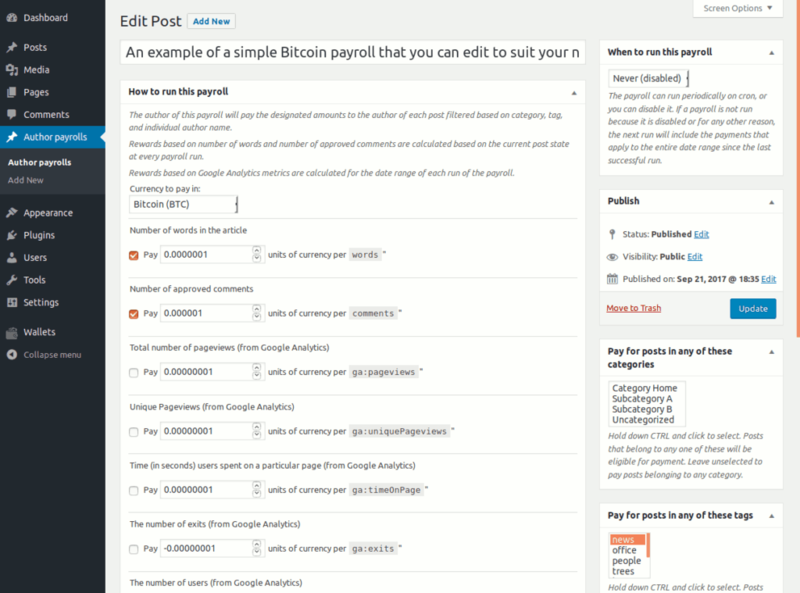 With this extension you will be able to create payrolls for article authors. 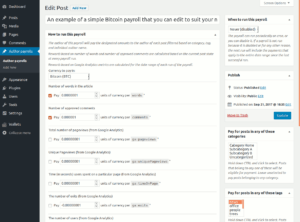 A payroll is a post type that exists only in the admin backend. Which articles it applies to. Filter your articles by category, tag, individual author, or leave blank to apply to all articles. How much to pay and in which cryptocurrency. The authors of the articles will receive an amount based on article metrics pulled from Google Analytics. You can specify that e.g. for every new view you will pay X amount of Litecoin to the authors. Make sure to tick the checkbox next to any reward that you wish to enable. How often to execute the payroll. You can choose between daily runs, weekly, monthly, etc. Every time a payroll runs, it will identify applicable articles, pull data from your analytics account, and figure out how much you owe to each author. If you have enough funds in your wallets, the funds will be transferred to the author wallets. As a payroll owner, you will receive an email every time one of your payrolls executes. You can turn the emails off but it is recommended that you keep them enabled. Each email will contain logs from one payroll execution. In the event that the payroll fails to execute, such as if connectivity to the analytics API is unavailable, or you do not have enough funds online, the next payroll execution will include the entire time range since last successful execution. This way the authors will never miss their earnings. You can specify negative rewards for some metrics. For example you can associate exits from the site with a negative amount. This will never cause authors to pay you. At every payroll run, the total reward for each author is calculated and is paid out if the reward is positive. If it is zero or negative no payment is made. 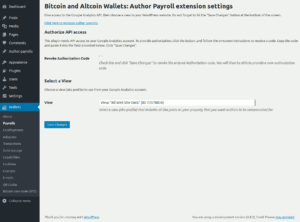 Install the Bitcoin and Altcoin Wallets plugin by following the installation instructions. Install and activate this plugin extension if you have not already done so. Go to Wallets → Payrolls. Click the button Get authorization for Google Analytics API to bring up a popup window. After choosing a Google account you will be presented with a code. Copy that code in the clipboard and close the popup window. Paste the code into the field under the button you clicked. Click on Save changes. You will now be able to select a view. Select a view of the site that you want to pay for. Click on Save changes again. Now go to manage the Author payrolls custom post type. You should already have one example entry installed. Edit that example or create a new one. Enter a title that will help you remember what the payroll rewards. Use the excerpt section to keep any additional notes. Choose the cryptocurrency to pay rewards in. 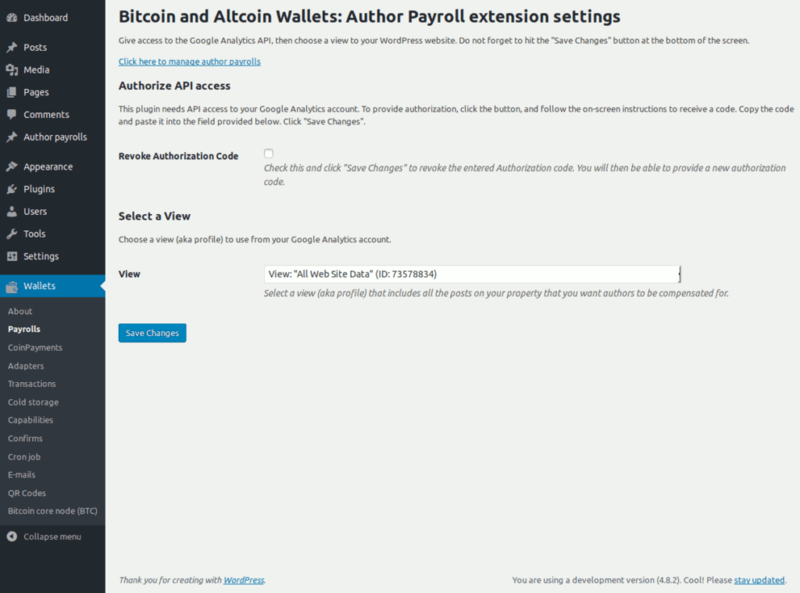 Authors of the articles you specify will receive rewards from the cryptocurrency account of the payroll author (you). Choose the reward amount for each metric such as number of words, number of approved comments, etc. Make sure to enable a metric using the checkbox next to it. Disabled metrics will not count towards author rewards. On the right hand on the screen, you can filter that posts that are rewarded by categories, tags, or authors. If you select no categories, posts are not filtered by category, etc. When you are satisfied that your payroll rewards the correct metrics, change the periodicity from never to some other value and publish the payroll. It will now execute periodically on cron. To make sure that you are receiving updates for this plugin extension and for all the premium dashed-slug plugins that you have installed, you will need to activate your installation.After registering at dashed-slug.net you will have received an activation code in your e-mail. This code is also available to you when you log in to dashed-slug.net. Follow the instructions given here. 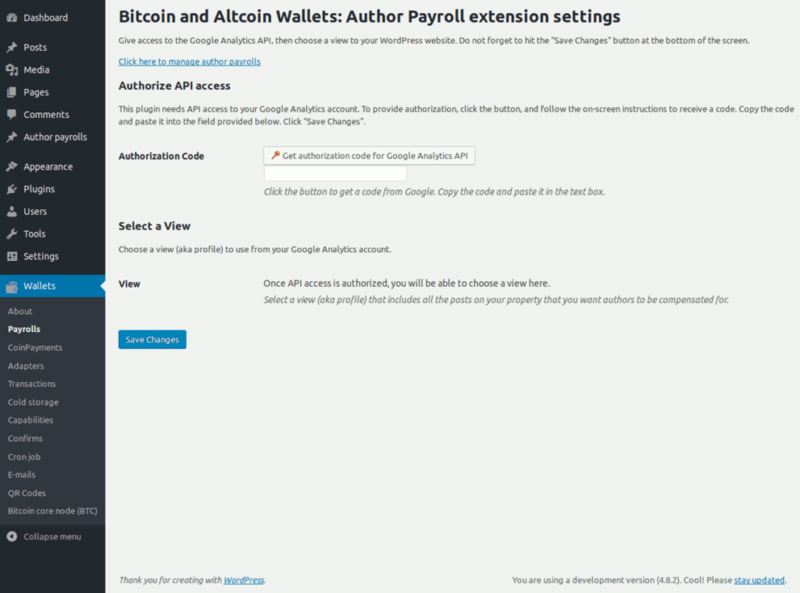 Check in Wallets → Payrolls to see if access to the Google Analytics API is authorized. Make sure that you have selected an appropriate view from your analytics account. An appropriate view will be a view that includes URLs for all the articles that you wish to reward. Also, make sure email notifications are enabled for your payroll. This is done at the bottom right part of the payroll screen. Remember that you will receive log reports for payrolls at the email of the user that you used to create the payroll. Payrolls are executed by cron. If you have disabled cron on your site, payrolls will not execute. 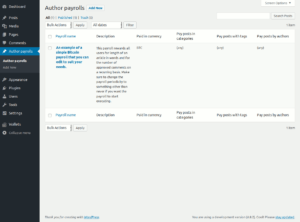 The execution logs for a payroll will detail exactly how the rewards for each article author were calculated. Static metrics such as number of words or number of approved comments are calculated and rewarded every time the payroll runs. Analytics metrics such as unique pageviews are time-sensitive and only the time period for which the payroll runs will be rewarded. For example if you specify that you pay X Bitcoins for every word and Y Bitcoins for every visit, on every execution the author will receive X times the total number of words in the article, but only Y times the new number of visits since the last payroll run. For any issues, inquiries, suggestions, and general feedback regarding this app extension, visit the support area. Updated on 2018-10-30T17:43:03+00:00, by alexg.